Description: While teaching classroom procedures and rules such as a quiet signal, lining up at the door, or using the restroom, teachers will introduce computational thinking with sequencing. For example, when the teacher rings the bell (quiet signal) there are steps every child should follow. Step one: freeze; Step two: quiet mouth; Step three: eyes on the teacher. These steps, when put together in a sequence, create an algorithm. Teacher will guide students to create an another algorithm with classroom routines that keep us safe, such as, lining up at the door: step one: stand up, step two: push in your chair, step three: walk to the door; step four: quiet body & mouth. 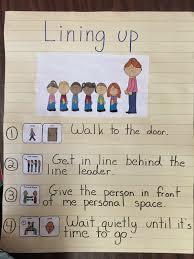 Once you have created the lining up at the door algorithm, have a class discussion about how each step keeps us safe in the classroom. (pushing in our chair so no one trips; walking in the class instead of running; quiet in line to wait for instructions) Class can create a chart to show each sequence and come up with their own algorithms. Some possible examples: emergency drill procedures, raising your hand in class, getting your tray in the cafeteria, walking in a line in the hallway, checking out a book in the library, etc. ELA TEKS: K.21B follow oral directions that involve a short related sequence of actions.